Did you know 95% of people don’t know how to wash their hands properly? According to Dr. Tania Dempsey MD of Armonk Integrative Medicine, “If everyone washed their hands with soap regularly, one million deaths could be prevented every year.” Sounds so simple, yet seems 95% of people are doing it wrong. October 15th is National Hand Washing Day, and to help spread the word about spreading germs I’m excited to share an easy and affordable solution: Live Clean Soaps. 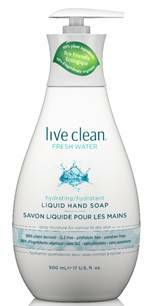 Live Clean Hand Soaps are composed with certified organic extracts and 98% renewable & sustainable plant-based ingredients; it’s cruelty-free, SLS free, phthalate free, paraben free. Available in three delicious flavors Coconut Milk, Fresh Water and Argan Oil at Target and Amazon.com for $4.99 – you get 500ml aka A LOT OF PROPER HAND WASHES! About Dr. Tania Dempsey MD: Dr. Dempsey received her MD from the Johns Hopkins University School of Medicine and her BS degree from Cornell University. She completed her Residency at NYU Medical Center/ Bellevue Hospital and then served as an attending physician at a large multi-specialty medical practice in White Plains, NY, before opening Armonk Integrative Medicine. Dr. Dempsey combines primary care treatment and integrative medicine with particular focus on thyroid dysfunction, autoimmune disease, hormonal imbalances, vitamin deficiencies, food sensitivities, and weight management. She is an active staff member of Greenwich Hospital in Greenwich, Connecticut. She is also a member of the Institute for Functional Medicine (IFM) and the American College of Physicians, and holds a certificate in Vanguard Endocrinology. Dr. Dempsey has been featured on Fox News, Clean Plates, Harper’s Bazaar, Prevention, Reader’s Digest, SHAPE Magazine and countless other outlets.